The character names are fantastic. Simple, totally whacked, but one can totally dig those kind of names in a story of heroes and villains. Repetition- it’s a strange kind of repetition that you’d expect to get on your nerves. It doesn’t. That repetition made the whole thing funny for me. And lists…. list of things people do, like… Those lists open up a whole new world of possibilites. It must be difficult to write a book and keep that same style throughout so fair play to Mr Taylor for following through. The more I read, the more I pull similarities in between this otherworldly book and real life. Superheroes, rappers, music industry… Is this book perhaps a sarcastic take on all of what we live? details, details and more details… of everything.. every new fact brings along a new imaginative side-story. There’s a lot of distracting, side-story stuff happening… It fills you in on the details, but for an impatient brat like me, I got frustrated! In a way, that’s the magic of this book! This book would be a great audio-book. Reading this has a feeling that the author is actually telling you a story. In a way Dr Don’t Know is a fantastic supervillain! His idea of taking over the world is genius! The whole 15 points of his evil plan sounds like a wicked torturous thing… and yet… it’s nearly the reality of our lives this very moment. in all seriousness I think, about half way through the book, I cracked the case for myself. 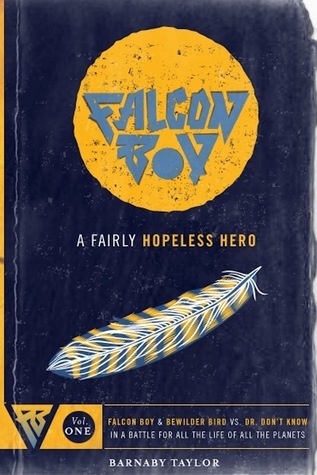 For me, Ellis is a child living in a world of wonders waiting to be discovered with her unrelentless and hungry mind and Falcon Boy and Bewilder Bird are her imaginary friends! But make up your own mind, with your own logic. This book is a take, in my wishful thinking, of the current day world through a child’s eyes spoken by an adult! I gave this book 3 stars which means I liked it. It is not a bad rating. It is totally different to what I would normally read but I am glad I read this- it’s different and I like to keep an open mind on what’s being published. I have a feeling this is a one of a kind book that people will either dig or not. Like or not… There definitely is an underlying of absurdity to it all and a more easygoing person would find it hilarious.